Nearly 15 years ago, the spirit moved me to build a bluebird box. 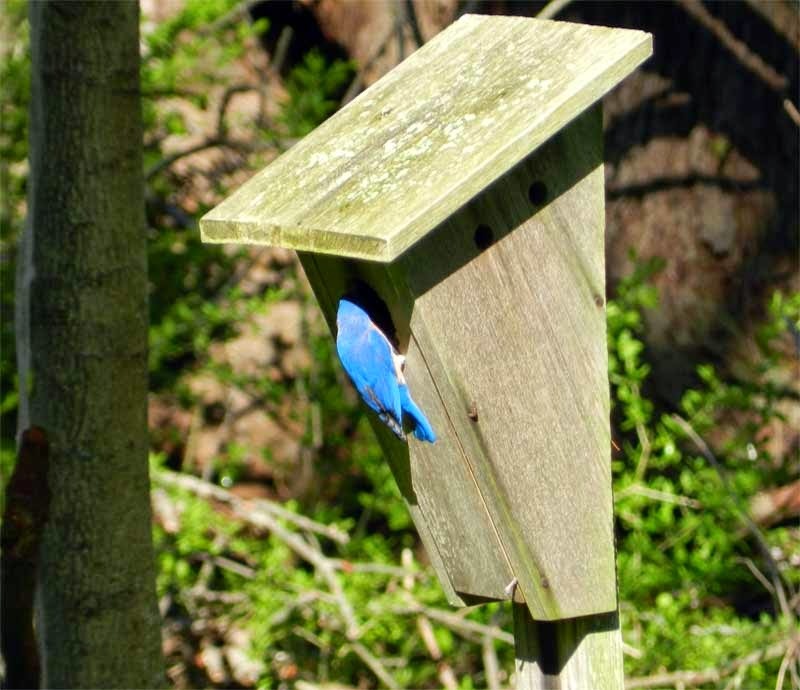 Bluebirds were rarely seen in my wooded yard, but I was struck with hope that a nicely built box would attract a nesting pair. Year after year, the box went unused. Some years, we spotted bluebirds inspecting the box. Once or twice, they seemed to actually start a nest, but then would vanish. A parent feeds the chicks. A bluebird pair not only built a nest, but laid eggs and is now in the midst of feeding chicks that are about to fledge. What happened? Here’s my theory. Last year, another spirit moved me to clean up the back edge of the yard, a 10-foot-wide strip along a stone wall that was filled with fallen trees, rambling wild shrubs, tall wildflowers that others might call “weeds,” and piles of brush from years of cleaning up after hurricanes and winter storms, seasoned with discarded Christmas trees and wreaths. The area had been allowed to run wild and the brush piles to grow for decades. The nesting box was on a post at the edge of this strip. However, the wildlife also included House Wrens, mortal enemies of bluebirds. The wrens could often be seen hunting insects in and about the brush piles. They may have nested there, too. House Wrens do not like to share their territories with other birds, and often chase away potential neighbors. Being cavity nesters like the bluebirds, they also might grab the nesting box for themselves. At the very least, they would chase the bluebirds away. Sometimes, as they are wont to do, the House Wrens would fill up the inside of the box with sticks, making it unusable for nesting. Many was the autumn that I would clean out a box crammed top to bottom with twigs. I believe that clearing the mess not only made the area less attractive to wrens, it also opened up the yard, making it more attractive to bluebirds. They like open fields for bug hunting — and, probably, for keeping an eye out for predators. My backyard “wildlife refuge” may be gone, but I don’t feel bad. On the other side of the stone wall is an acre of woods and wetlands, full of wild things. And my yard now has bluebirds.